There are so many reasons that the AUKEY Latitude Lite Bluetooth Headphones are so popular with our readers. 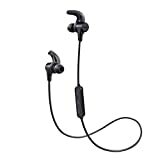 They offer great sound quality and solid battery life at a surprisingly affordable price, and they’re sweat-resistant so they’re great for workouts. If you thought they were affordable before though, just wait until you see the sale Amazon is running today. Use the coupon code DSIO6DSB at checkout and you’ll get these terrific $26 earbuds for just $15.85. That’s an all-time low, and it won’t last long.